In an astonishing find to usher in the Christmas holiday season, scholars have found a copy of the original Greek manuscript describing what Jesus secretly taught his brother James. According to Science Daily, Biblical scholars at the University of Texas at Austin discovered the manuscript in the Nag Hammadi Library at Oxford University, where it may have been a tool teachers used to help students learn to read and write. Life in the Boomer Lane cannot stress enough the import of this find. On the one hand, it would be a rare and precious resource that might shed light onto the world’s most well-known, influential, visionary, charismatic, and yet obscure figure of all of human history. On the other, it’s a swell way to discover what bored students were doing during the fifth and sixth centuries AD. Life in the Boomer Lane, ever the intellectual scholar, is choosing the second path. She will leave Jesus history to those far better equipped to make sense of all of it and she will happily wait for the future Discovery Channel special, covering all the details, with the required dramatic simulations. LBL can now turn her attention toward more pressing and entertaining matters. 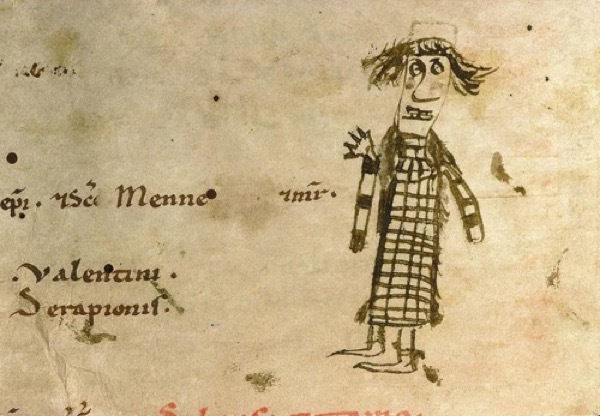 Cartoons, illustrations, and notes in the margins of various sections of the manuscript confirm that fifth and six century students were continuing the longstanding tradition of enjoying utter boredom during class, coupled with a desire to leave their mark on history without having actually accomplished anything. While LBL has not seen any of the manuscripts, this does not deter her from making flagrent statements like the one above, based on nothing whatsoever but her imagination. She envisions a range of silly, amusing, sexual illustrations, as befits young people trapped in an academic setting. Because her technological skills don’t support showing these to loyal readers, she leaves it up to them to assume the worst. She leaves you with some final questions: Why would sacred documents be used merely as teaching materials? Why would students be allowed to deface such documents? And will Marcy end up with Nick, or will this be the start of a long string of tragic disappointments in her life?